I apparently love tinkering with my deodorant recipes. This detoxing homemade clay deodorant had to go through many tests in order to make it glide nicely, work wonderfully, and also not be a melting mess. My Coconut oil and baking soda deodorant recipe is easy, frugal, and fun because you get to add the scents that you like using essential oils that will also kill bacteria. I have never had a problem and LOVE it, as do most people. It really works! Get the Recipe here. You can also make spray on deodorant, which is also easy and frugal. There are a lot of options too. Get the Recipes. Yet, I now know 3 people who have had difficulties wearing homemade baking soda and coconut oil deodorant. The reason behind this? I believe they have a sensitivity to the baking soda. Baking soda can be chaffing if you are an active person or get super hot under the arms. For this reason, and for the detoxing benefits, I have put together some great options for a non baking soda deodorant. Yes, along with nice smelling underarms, you get added benefits! Bonus! It absorbs toxins from the skin by creating a leaching effect around the under arm lymph nodes (where a lot of toxins are stored). It extracts heavy metals from the skin. It is calming and soothing to the skin (so no more under arm chaffing). IMPORTANT: As stated in my Anti Aging Clay Mask Recipe, Bentonite clay loses some of its potency when it comes in contact with metals (If it has already absorbed some of those metals, it will not be able to absorb as much from our bodies), so use a glass bowl and wooden spoon to mix this deodorant. ***Updated 7/24/15 – I’ve played around with the proportions and have updated this recipe accordingly. I think it glides on better, and even works better than the previous proportions. This is now my favorite recipe by far!! A great detoxing deodorant that doesn't melt and really works! Combine bees wax, coconut oil, and shea butter in a glass bowl (or glass measuring cup) and heat over boiling water. Stir until melted and all ingredients are combined. Combine arrowroot powder and clay in a separate bowl. Pour into an empty deodorant container and let cool until hardened. Fills 1 standard 2.5oz deodorant container. If it’s the middle of a hot summer, consider buying 92 degree coconut oil which has some of the MTC oil removed, making it harder at higher temperatures. Otherwise, you may need to use it as a paste or keep in the fridge until the season cools down a bit again. Essential oil suggestions: Tea Tree is good at killing bacteria, as is lemon, grapefruit, and orange. Clary sage has an astringent effect, helping you to stay dry. Ylang ylang just smells amazing 🙂 Choose what you love and enjoy. 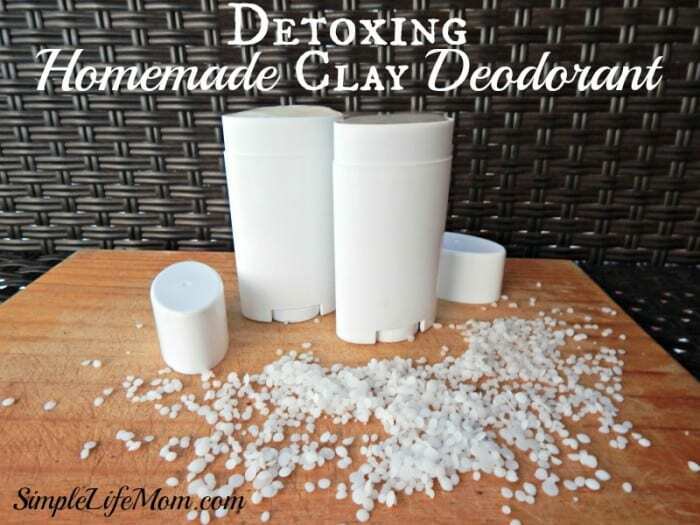 I haven’t tried making my own Deo! But I am allergic to the aluminum in most commercial versions so I am excited to try one of these recipes! My lymph nodes started to swell painfully from using anti-perspirant deodorant, which is why I started making my own. I don’t use anything else now. They really work. I have been really thinking about making natural deodorant since my 10 year old daughter has started needing deodorant. This recipe seems easy enough. Pinning this to my “All Natural” board to make very soon – thanks for sharing! Very interesting. Thanks for sharing this with us. I’ve been thinking about using more natural prducts but I don’t know where to start. Thanks for the recipe. I may just try this. I’m all for natural. Me too Juilie. Thanks for stopping by! I like how this does not contain baking soda, as that can be irritating. How does this work on keeping body odor at bay? I have tried a few baking-soda free recipes, but haven’t found one I have fallen in love with yet…may have to give this one a go! Baking soda really does do the trick. This one is also really good. I tried it at different ratios and didn’t find it effective with a higher oil ratio. This one is made with a higher arrowroot powder/clay ratio which really makes the difference. Add clary sage and tea tree for an astringent and anti-bacterial effect. Great! Thanks for the tips Kelly! I would have never thought about making my own homemade deodorant! What a fantastic idea and a great way to make sure you know exactly what is going into the products you use! 🙂 Thank you! 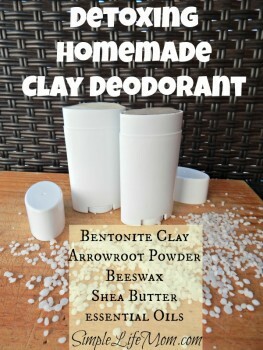 I make my own deodorant, but have never added Bentonite Clay. I am definitely going to have to try that. May I ask, where would I find the clay? I am so glad you shared your wonderful and informative articles at Roses of Inspiration. Enjoy your day! I get mine on Amazon or Mountain Rose Herbs. You can click on the links in the article. Is there anything you can substitute for the coconut oil? I am extremely sensitive to it, but I would love to try this! Yes. Replace it with the shea butter, or you can add a bit more shea and another oil such as olive. The olive would make it softer so you can play around with the consistency. You can always leave it in a jar and just scoop a bit out on your fingers and rub on your arm pits. I do this with mine in the summer hot months instead of putting it in the fridge sometimes. My daughter and I just made this because she is young and we wanted something natural. She was instantly turned off by the green. Can one use baking soda instead if the kaolin or bentonite? Does the product leave grease stains. It does not leave grease stains. You can definitely use other clays instead to achieve a white color. I use it and it does leave grease stains if you don’t let it COMPLETELY dry before it touches clothing. I put it on shirtless, then carefully put on my shirt once it has dried. That seems to help. Yes, I’ve noticed a little staining over time (months) on my white shirts, nothing else (I put it on and go, no waiting so that may be why). Thanks. I may try the baking soda recipe. I will have to use the green recipe with lemongrass for myself. It worked well for sweaty sandal feet today too. Hi there!! I made this deo this morning and it has yet to harden! I wonder what I did wrong? I followed ingredients/measurements above. Is it supposed to be solid or paste-like? If your house is 80 degrees and above it will be paste like. You can keep it in the fridge to harden during those months. Otherwise, add a little more baking soda or arrowrootpowder powder to give it a little more solidarity to harden. This was my first homemade deodorant and I’m so happy I chose this recipe. 🙂 I’m really surprised how well this works. Amazing stuff! i have made other recipes in the past and found baking soda to be irritating, so I was happy to find your recipe. However, mine turned out extremely soft, almost runny. Can I reheat it to add more beeswax or something to make it firm up? Which would be best to add? Beeswax, clay, or arrowroot? You can reheat slightly if adding arrowroot to it cold does not give you the right consistency. After warming add more clay and arrowroot. Adding more beeswax can give it a texture that doesn’t glide on very easily so be careful there. thank you so much for this recipe. I have suffered with under arm cysts all my life. I just learned about deodorant causing cancer few months ago and I thought hey if it causes cancer it may just be the reason for my cysts. I did a two month test. No deodorant for two solid months…..had to wash my pits more often but guess what? I haven’t had one cyst ! and I usually have one under each arm all the time ! their so painful. I just made 5 tubes of your deodorant and I can wait to use it but I have a concern…..how long before it fully becomes solid ? Seems to still be a little runny……..well not runny but not solid either. does it take 24 hours? I am so excited for you to start seeing some relief! My swollen lymph nodes were very painful. If it’s still a little soft, no problem. Pour it back out of the containers, into a double broiler or glass measuring cup and heat slightly again. Add more arrowroot powder, or even some baking soda (my favorite in deodorant). It should harden after it cools, unless your house stays above 76 degrees. You can put it in the fridge for a bit to accelerate the process. Let me know if you have any other questions. I substituted Bentonite clay with Kaolin clay. The Bentonite clay is the one that makes it dark, the Kaolin is white and it does the same job. If you have EO try with 5 drops Tea Tree oil and 10 drops Ylang Ylang…it smells heavenly. I have been trying different homemade deodorants and so far nothing is working for me. 🙁 I found out the hard way that I can’t use baking soda. Broke out in a rash. I tried your homemade recipe and it’s not working either. 🙁 Is there any thing else that you can recommend that I can try? Adding clary sage essential oil helps slow sweating (though sweating is a good thing sho I like to focus on killing bacteria instead). Tea tree and cloves are good for killing bacteria. Melt salt in your oil first. This helps make your armpits less hospitable for bacteria. Splash Apple cider vinegar on first. Some people have more glands than others that secrete proteins from your diet that the bacteria feed on. You may just genetically have more and have a more difficult time. Obviously stress and a poor shirt contributes as well. I hope something in this helps or gives you ideas. ? I tried this recipe but the clay did not dissolve. It just settled at the bottom of the mixture when poured into container. How can I better incorporate clay throughout? I have never had that happen. Did you add anything else (like aloe liquid, etc.)? I once tried to make a recipe with aloe and oil. Obviously, they didn’t mix and it was a grainy mess. Is your clay a fine powder? I would melt it gently in a double boiler, let it cool slightly, then whip it with a hand mixer and try again. If most of it incorporates and only a small amount is left behind you will still gain a lot of the benefits. Thanks Kelly, I followed your recipe with no added ingredients. However, my bentonite has a sandy texture rather than a powder. Can I do anything to refine it in your experience? Appreciate your feedback and love your recipes! Sorry Anna, but it’s got to be the brand of bentonite clay that you purchased. This recipe is for those who have problems with baking soda. Yes my favorite recipe uses both clay and baking soda (equal amounts of each). Underarm odor also depends on diet (high protein diets can make it worse as well as junk foods) and how many cells you are born with that dissolve proteins in that area. Some people are just born with more. I love this recipe and am very happy with the results so far! Thank you. I do live in a warm climate and found the deodorant is too soft to apply from a normal deodorant container. I would like to harden it just a little, would you recommend increasing the beeswax or arrowroot powder or both??? Did you use the 92 degree F Coconut oil? IT has some of the MCT oil removed from it and so it can stay solid up to 92 degrees. If not, then you can add a bit more bees wax to your recipe, but be careful not to add too much or it won’t glide well. Cocoa butter is also a good option. Too much arrowroot powder can be irritating to the skin (dries it out too much) so I would try the other options first. I tired this recipe and it works great. Thanks Anita. Great to hear your experience. I really wanted this to work for me, because I absolutely cannot wear antiperspirant (nor do I want to), store bought natural deodorants do not work well for me, and the recipes with baking soda give me a bad rash. Sadly, I made this today, as I happened to have all the ingredients on hand, and it’s really messy. After melting the beeswax, Shea butter, and coconut oil on the stove, I added the bentonite clay and arrowroot powder, and it became really thick and goopy. It was quite difficult to get it into the deodorant container. I put it into the fridge to harden for a while, and it became too hard, so I let it sit out while I showered. When I used it, it smeared thickly, made a mess, and formed into clumps on my skin. It also made my armpits green. I’d worry that it would stain light clothing. I’m totally willing to consider that I did something wrong though! I think maybe the Shea butter I have is a little past date. I don’t know. I’m frustrated, because I’m having a hard time finding a good deodorant that works for me. The best recipe I’ve tried yet. I use tea tree and lemon EOs. Thank you so much! Going to try this as soon as I get some arrowroot! I purchased this from you on Etsy and it really works great. I tried the coconut oil/baking soda/arrowroot deodorant that is very common and I felt oily/wet under the arms constantly, it stained my clothes, and it only partially worked. With this I feel much drier and it keeps the stink away much better (even the next day). The first day I applied too much and it left some stains on my shirt. Haven’t done laundry yet to see how it washed out. The second day I put about half as much and no noticeable stains on my shirt. The detoxifying deodorant I bought from you had baking soda in it. Is there much difference in consistency/effectiveness? My only drawback is I like to feel powdery dry and this doesn’t quite do that. I don’t know if it possible to make a powdered version of this? 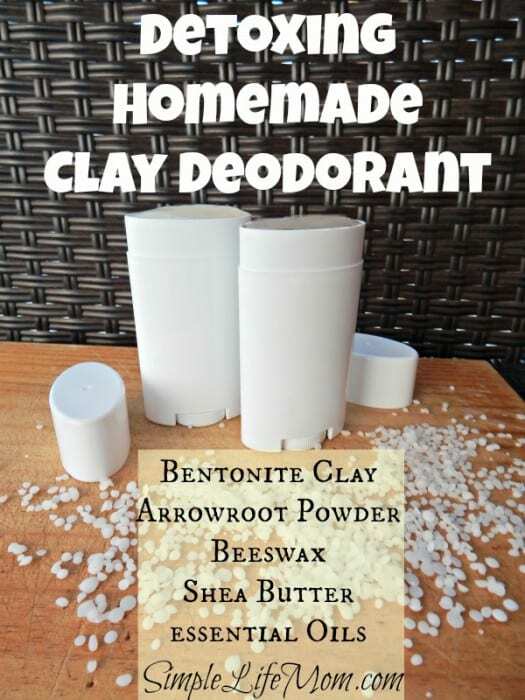 Using bentonite clay, arrowroot powder and baking soda? I don’t like anything that feels remotely oily on my skin, so it’s just a personal preference (problem : )). You can defintiely use the powdered mixture. Let us know how it works for you. Everyone’s different in their body makeup and preferences. I add a little bit of baking soda to the one in my shop because I think it makes it a lot more powerful. A friend recommended this to me and I was looking at your recipe…I noticed that in the instructions it tells you to combine the arrowroot, clay and baking soda…but, in the ingredients there is no mention of baking soda. How much do you recommend? Thank you for your time. Thank you for the recipe!! Thanks for catching that. In the one I make at home I always add baking soda, but since this one was requested as a no baking soda recipe it is a typo. You can add baking soda, substituting it for some of the arrowroot powder if you prefer. It works great both ways, but if baking soda doesn’t irritate your skin then adding a little gives you an extra bonus against under arm odor. It is impossible to find arrowroot powder where I live. What can I substitute for it? You can sub cornstarch for arrowroot. This seems really cool and i can’t wait to make it but what can i substitute for coconut oil? You can sub another oil but it will be a softer deodorant that you’ll have to put in a fish a scoop a little out (more like “pit paste”). I am making this recipe now so I’m sorry if you answered this question already, but I’m just realizing I’m not sure if I should use the Bentonite clay I have 1 Tbs powder or mix it with water first to turn it into a wet clay and use 1 Tbs of that? Just melt the beeswax and oils and then add the powders to the melted oils. When you stir it will become a thick consostency that you can still pour into a container to harden. I live in Texas and as we approach the summer months I would like too increase the solidity of this bar so it can remain in a regular deodorant container on the bathroom shelf w/out become squishy. Could I increase the ratios of arrowroot powder, clay, & bee’s wax to accomplish that w/out compromising the feel of the application of the deodorant? Would you have any suggestions on what to increase, or how much to increase it by? That’s really hard to do and maintain its ability to keep you smelling fresh. I would suggest finding coconut oil that is solid until 96 degrees. Bulk Apothecary carries it and it works great in the summer. You could use one of those deodorant containers for gel deodorants, the kind with the little holes on top. Great! Thanks for the fast response, I will definitely get some of that in, but going to go ahead and make a couple of these for me and my girlfriends to try while we are still enjoying some wonderful spring temps!! I used to be able to use baking soda homemade deodorants but recently began developing a red rash under my pits :/ I read it can be due to hormone changes *shrugs* Bentonite clay is the next recipe to try, thanks! Some people become irritated with the baking soda. I’ve never had trouble, but I’ve had friends who have, which is why I made this. I don’t think it works quite as well, but it’s still better than most – if not all 😉 – store brand natural deodorants. Just wondering does your deodorant melt in the summer due to the high heat temperatures. I made a different version of clay deodorant and it completely melted in my bathroom. Also the clay seems to be clumping under my arm. Have you had any trouble with any of the above? I will be trying this recipe, I have heard using bees wax helps it not to melt. Using a coconut oil that doesn’t melt until 96 degrees is important. Bulk apothecary sells some, as well as Amazon. Beeswax also helps. To avoid the clumping under the arm, apply when it is colder (out of the fridge) or with the 96 degree coconut oil so you limit the amount that is applied. If it’s too runny, apply with your fingers instead of a tube to apply the right amount. I tweaked the recipe a little bit and used Shea butter and Almond oil instead of Coconut oil. Turned out great! I made two batches, fir needle / lavender and orange/ clary sage. Am now on day 4, and it works! So thrilled!!! Thank you. Thank you so much for this! I just made my own and I used 5 of the 15 ml containers. They are great for traveling and super cute! Great recipe, thank you again! I made this last night and followed your recipe to the letter. The deodorant stick does not wipe under the arms cleanly. I still have to use my fingers to smooth the globs under my arms. Have I done something wrong? You did say a tablespoon of clay correct? You can thicken it a little more by adding more arrowroot powder. Sometimes the slightest difference in temperature or amount of coconut oil makes a big difference in consistency unless you use 97 degree melt point coconut oil. My 16 year old daughter and i have been using variations of this recipe for a couple of years now. I used Kaolin clay in my recent batch as well as ylang ylang as the essential oil. We’ve been using it for about a month and this past week we both got swollen painful lumps in our under arms. The exact same time?! Weird! All I can Think is the clay is pulling out toxins and our lymph nodes are swollen. Have you had this happen? If it was just one of you I would wonder if hormones or other things may have made the lymph nose swell. Since both of you had the same thing happen it makes me think it may be the deodorant. It may not be the clay, but it could be too much of an essential oil and it’s too hard on your system to use constantly….Did you use an oil that you’ve never used? I would definitely stop use to see if that alleviates it. You may need to play with the recipe a bit to see what works. Ok thank you! Yes we used Ylang Ylang for the first time. I was using citrus ones before and I was getting a rash so we switched. maybe I used too much. Thanks for the feedback! Citrus oils seem to be the top oils that people become over sensitive to from using too much. Ylang ylang could be your issue, especially if your body was already on guard from the citrus. I’d try switching oils and only use a small amount. I tried making this today but it was too dry to fill the deodorant container. Are the proportions correct? It was pasty not liquid to pour. ?? It will be a thick, but still easy to pour. The proportions are correct. You can reheat and add some more coconut oil (1-2 Tbsp) and pour into your container. Mine was super thick too! I needed to use a knife to get it into the deodorant container. I used kokum butter instead of Shea as it’s a harder butter since I was hoping it would firm up better. I also used kaolin instead of Bentonite clay. I will use the 92 degree coconut oil in my next batch as it’s still soft – more of a pit paste consistency bi would like it to be able to glide like a regular deodorant. Any other suggestions. Mine is also a tanish color and not white. You had to use a knife to get it into the container, but it didn’t set up? That doesn’t quite make sense, but I’m guessing if you’re having problems it’s all the substitutions you made. Make sure to pour while it’s still super hot. place in the fridge to help it set up faster. Just made this today again and it set up perfectly hard for gliding. That’s wonderful to hear! Glad it’s of use. ? It sounds like something might have been left out or not measured correctly by accident because it should definitely be set up with 96 degree coconut oil! You can heat it up again and add more baking soda and/or a touch more beeswax. I dont recommend more arrowroot as it can start to dry out the skin in large quantities. Is this the same recipe that you sell in your Etsy shop? I notice that baking soda is also listed in the ingredients there. It is, but I do use baking soda in my shop recipe. I think it is more effective. Some people can’t use baking soda, so this makes a great alternative recipe. How much baking soda and arrowroot do you put in for your shop? I use a 50:50 ratio. You can just leave it out. Bentonite clay is added for its medicinal benefits. I’m wondering if French green clay is an okay substitute instead of bentonite? Yes, you can use French green clay. I see someone mentioned adding active charcoal. If I wanted to do that how much would I add? I’m making the recipe without the baking soda. Also could I do 1 Tbsp of Shea butter and 1 Tbsp of Cocoa butter? I would suggest 1 teaspoon charcoal to each bar being made. Are you asking if you could replace 1 Tablespoon shea butter with cocoa butter? You can definitely do that. It will be a little harder. I made this and it’s soooo very very soft. As in, doesn’t glide at all. I followed the directions 100% exactly as stated, however, my coconut oil is super soft, could that be the issue? Thanks!!! Yes, when it’s this time of year, it’s best to use a 92 degree coconut oil. This just has some of the MTC oil removed to make it harder. You can also add more wax, but you want it to be able to glide nicely so that’s not my first choice. Until then you can keep it in the fridge. Sorry, I’ve given these tips in the comments, but they’re probably hard to find at this point so I’ll add them above to the recipe. Let me know if you need more help. Hello Kelly, I can’t wait to try this out. I’m making the move from commercial products to homemade deodorants, solid perfumes, and lotions. I was wondering if you could substitute sweet almond oil instead of using coconut oil. I know sweet almond oil melts at room temperature, so I was wondering how that would change the consistency. I’ve already decided to use glass jars, rather than the standard deodorant containers. Just wanted to get your thoughts and opinions. Thanks! If you change to sweet almond oil it will have a liquid consistency. Hi, I want to add activated charcoal and baking soda to the recipe. Do you think that would throw the recipe off and not work, especially with consistency? Thanks for any advice.